Five or so years ago, I sat in my apartment in DC one late winter evening with my friend Reed. We were surrounded by dirty mugs (we’d actually taken pictures at the number of coffee cups in my dishwasher as a joke, to document how hyper-caffeinated we were), index cards, papers. It was a chaotic scene, and I was adding to the chaos with something resembling a meltdown over not being able to figure out a complicated genetics problem. We were approaching the second exam in our genetics class. The first exam had taken us all by surprise: at that point I was used to getting Cs on post-bacc tests, but most of my peers weren’t, and a hush had fallen over the class when that test was handed back. Few had done well, and some of us had done worse than others. For me, it wasn’t the single grade so much as the prolonged discouragement of feeling as though I couldn’t catch a break in the program. And I hated the thought of spending yet another semester with the heavy burden of having to redeem myself on the next test, or else end up with a grade on my transcript that I wouldn’t be able to recover from. Reed and I had been doing our best to prepare ourselves for the test. He was as calm and organized as ever; he’d shown up at my place with an action plan and a stack of neat, detailed flash cards. It was no surprise: Reed was a supernaturally talented student, and in fact, seemed supernaturally talented at everything. He ran weekend marathons and practiced jiu-jitsu at the blackbelt level while achieving near-perfect grades in our program and continuing to work in finance nearly full time. It wasn’t even possible to resent all of the talent and ability, because on top of everything he was a really nice personâ€”and an unusually patient study buddy. I kept trying to convince him that I wasn’t game for this struggle, and he kept refusing to buy it. “I’m going to stay here until you work your way through it,” he said. (It was past midnight). I was tired and irritated to be getting this kind of a push from a friend, but Reed’s insistence worked. An hour later, I’d solved the problem and explained it to him in my own language. It wasn’t a test or a tutoring session, but it was probably the first real learning breakthrough of my post-bacc, and there were more that followed. I think about Reed’s words each time I’m feeling spectacularly ill-equipped to do something. I think about how sure he was that, if I spent enough time with it, I’d figure the problem out. The greatest challenge of my post-bacc wasn’t the difficulty of the classes, or the workload, or even the sleep deprivation. It was my belief, which seemed to get affirmed with every poor grade, that I just didn’t have the brain for science. Reed believed otherwise, and his faith softened my own lack of confidence. This week, I began my second clinical rotation. It’s at a large hospital, and I’m working in acute care. It’s a much faster pace and a more stressful environment than my first rotation. I’ve learned how to apply clinical judgment in the last seven weeks, but now I’m facing cases that are a lot more medically complex than most of the ones I’ve seen. It’s daunting, and while I haven’t completed an assessment on my own yet, I’m wondering if I have the critical thinking skills to do it. I’m glancing back to that night with Reed and reminding myself that discouragement and self-doubt can be much bigger obstacles than lack of knowledge or practice. I’m keeping in mind that every single dietitian goes through this experience; my current preceptors did it, too. I have to imagine that no one feels prepared, or able, at the start. Interns do their best, and preceptors are there to guide, support and teach them along the way. At my last rotation, one of my preceptors noted that I was still hesitant to address labs in my assessments. She was right: I still had the feeling that I wasn’t ready for the more medical parts of dietetic practice, interpreting bloodwork included. “Take a crack at it,” she said. She wasn’t being flip; she went on to explain that she’d correct me and explain my mistakes if necessary. But she wanted me to try. She wanted this, I know, because it was her job to help me become more confident. And confidence, at least in these types of settings, isn’t a have or a have not. It’s acquired through practice, through trying and sometimes failing and then trying some more. My preceptor gave me the same push that Reed gave me five years ago. Today, at the start of week 2, I’m giving myself that push. I don’t expect to wield perfect clinical judgment this week, but I’ll challenge myself to keep trying. That same, excellent preceptor at my last rotation said to me at the beginning, “what we’re really looking for is growth.” Growth I can handle; growth I can do. Wishing you all a great Sunday, and a good start to the week. I’ve got a cozy new soup recipe headed your way in a couple days. For now, here are some links I’ve been enjoying. 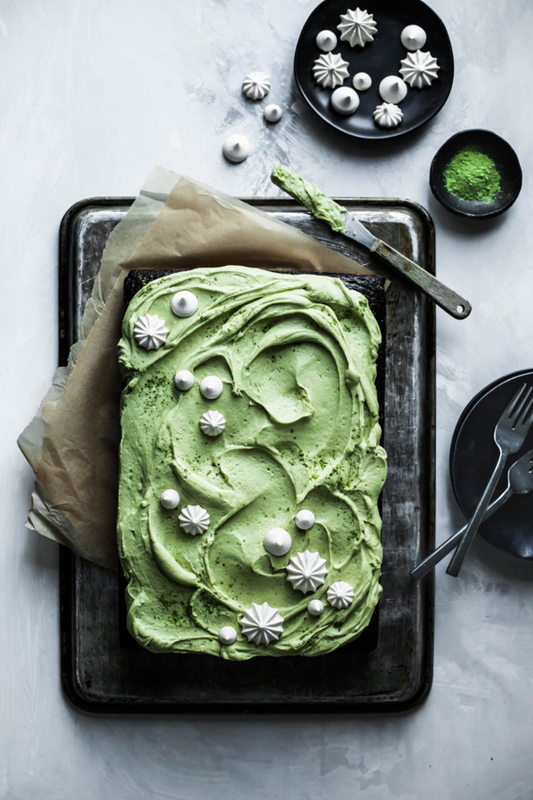 I cook with cashew cream all the time, but walnut cream? 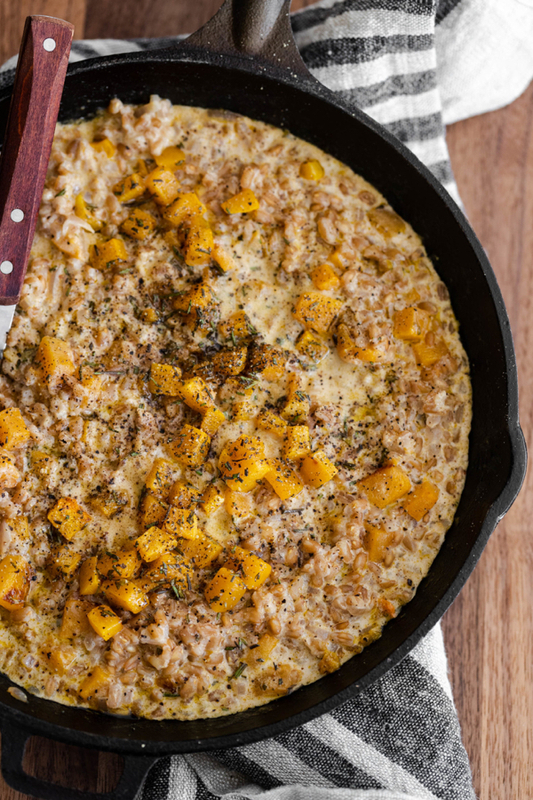 What a great idea (and great looking risotto) from my friend Erin! Has anyone else started collecting Thanksgiving recipes yet? 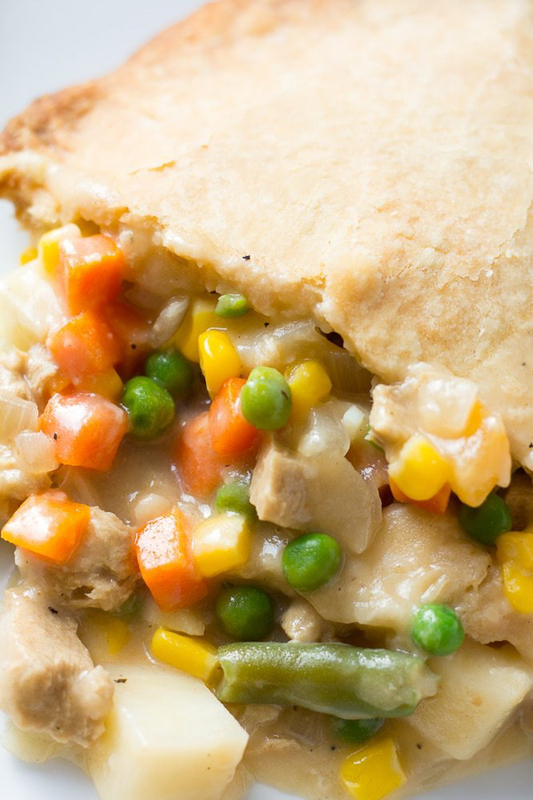 This vegan pot pie is going on my list! I love the idea of a mole pasta, and this particular one looks so cozy and filling. Bonus points for plant protein from black beans. 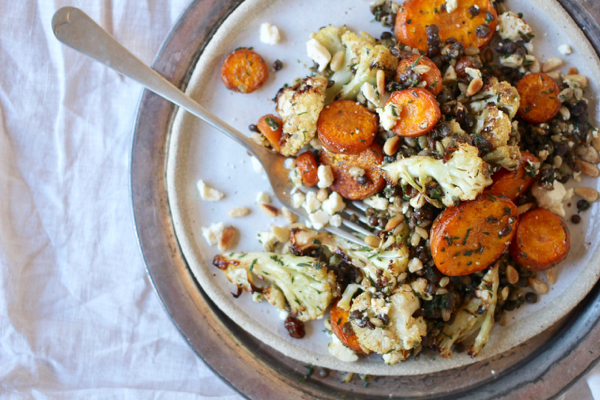 Can’t wait to try this wintery cauliflower, black lentil and carrot salad with some of my tofu feta. 1. I enjoyed this touching essay by a pediatrician, published in the New York Times, about wearing a hijab around family to help mask the side effects of chemotherapy. 2. 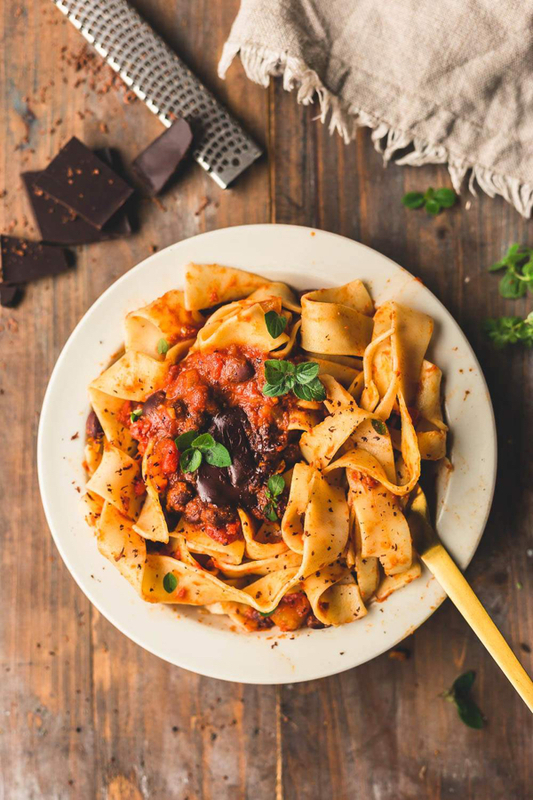 An interesting new study, conducted by a doctoral candidate in the UK, associates vegan diet with improved mental and physical health for Type 2 Diabetes patients. 3. I’m sort of fascinated by flow states, and this article touches upon their relationship with the perception of time. 4. Amanda Mull’s hard-hitting, insightful perspective on the language and branding of new health/nutrition apps, home testing kits, and other technologies. Her take, which I think is compelling, is that the emphasis that these technologies place on “optimization” echoes and potentially reinforces the perfectionism and rule-bound thinking seen in eating disorders. 5. I’m not a mother, but having had my own brushes with mental illness, I’m really grateful to Alissa Ambrose for this essay on post-partum depression. 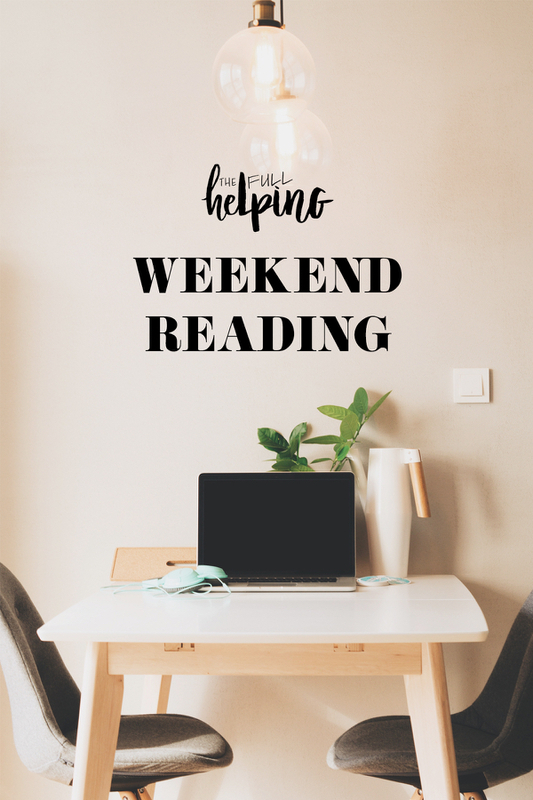 The post Weekend Reading, 11.4.18 appeared first on The Full Helping.